Each year at Joseph Chamberlain College, we organise and host the Model United Nations (MUN) conference, welcoming approximately 500 students from sixth form colleges across the country to our campus. MUN was set up in 2011 as a way of increasing the global awareness of young people, who will be the next generation of leaders and social changers. Our original event was the first of its kind and maintains its status as the largest in the UK. MUN is a discussion forum parallel to the work of the United Nations. Though the event is no inferior or ‘pretend’ debate; UN Secretary-Generals have spoken at conferences and agreed to take MUN resolutions to full United Nations meetings in New York and Geneva. It’s no coincidence that US Supreme Court Justice Stephen Breyer, former World Court Justice Stephen M Schwebel, Samuel Jackson and Chelsea Clinton, were all involved in Model United Nations in their youth. Over the course of a spring weekend, students come together to debate issues, develop compromises, practice public speaking skills and work with peers they’ve never met before. Part of the conference involves students attending committees to debate resolutions on controversial topics including global issues. Previous years have seen debates on weapons of mass destruction, violence in Latin America, piracy, illegal wildlife trade, prostitution, drug trafficking, black market medicine, the refugee crisis, euthanasia, the safety of reporters in war-torn countries, corporal punishment, free trade, democracy, interstate espionage, Tibet, ocean toxicity and Syria – to name a few. 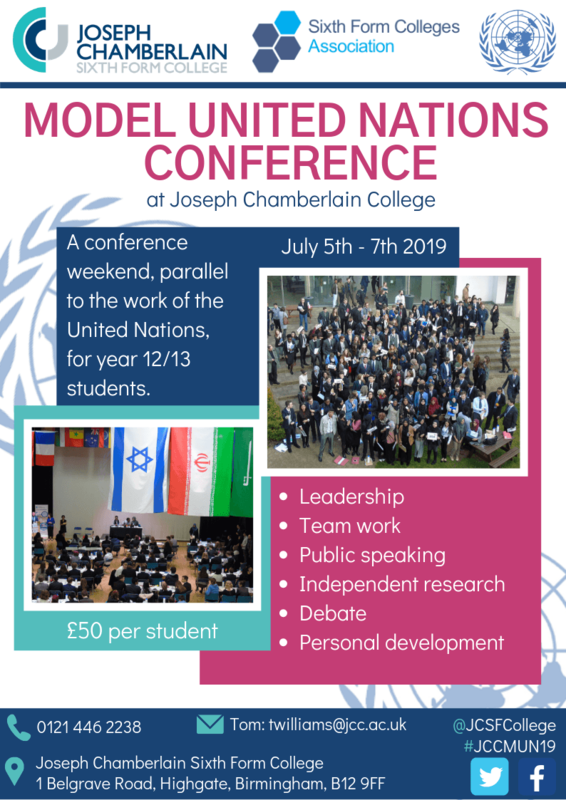 To sign up to JCCMUN19, please click here. Please note, only one member of staff needs to register on behalf of their college and students. For more information about MUN, please email Tom Williams at twilliams@jcc.ac.uk and follow our social media channels for regular updates.